Not exactly sure how it happened but a reporter from one of our local News Papers, The South Delta Leader, called and asked for an interview. It seems that one of my grandsons was visiting a friend and the friends mother asked if the boys knew of anyone who did crafts for anything like that. Tyler, one of my grandsons said no BUT his Gramps makes wooden bowls. I was pretty excited about the request and to meet with her and have an article written about me. Christine Lyons, the reporter and a photographer arrived as scheduled, we had a very nice session of questions and photos. We spent about 45 minutes in my shop and studio discussing my work and taking photos. This is just a small town paper with a circulation of only about 60,000 but I am still pretty excited to see if it helps me sell any more of my pieces. The article should run in the Paper on Dec 2.11. I’ll post a link once it appears. Well, it seems the my brain never ceases to keep working regardless of whether I want it to or not, even often as I sleep. If you read my previous post re the Bottom Finder Jig, then you will know I spent some time trying to come up with the Jig. Last night while half asleep I realized I had done way more than I needed to. The jig I built will work every bit as good if not better, as a indicator, if the thickness of the bottom of the bowl is measured with callipers prior to mounting on the vacuum chuck. Then after the bow is mounted the Jig can be set to indicate the bottom without the need to measure through the drive shaft. 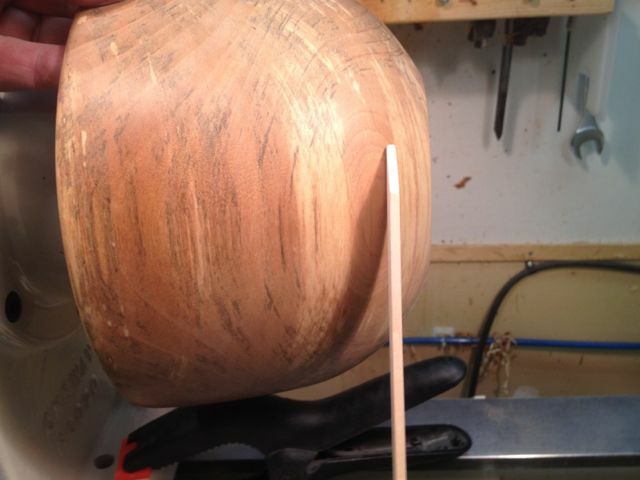 Next I set the right had side of the Jig arm to the outside bottom of the bowl. Then I measure the caliper to find out how thick the bottom actually is. I then mark the arm of the Jig with the width of the callipers as I just measured, and reset the jig that amount. 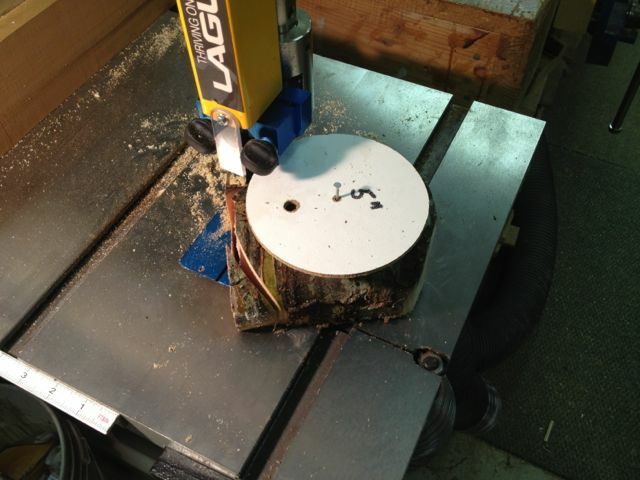 Here is the jig indicating the bottom of the inside of the bowl. It is again the right hand side of the arm. No guessing at all now. I can make the bottom exactly whatever thickness I choose and not worry about going through and producing another ‘funnel’. My first effort was a little over engineered as usual! I did notice when I used the Jig today that if there is a situation where I can’t use the callipers or for some other reason can’t actually measure the bottom thickness then my first jig will do the job. Once again, if you have any questions please don’t hesitate to let me know. Sometimes even I, wonder about me!!! 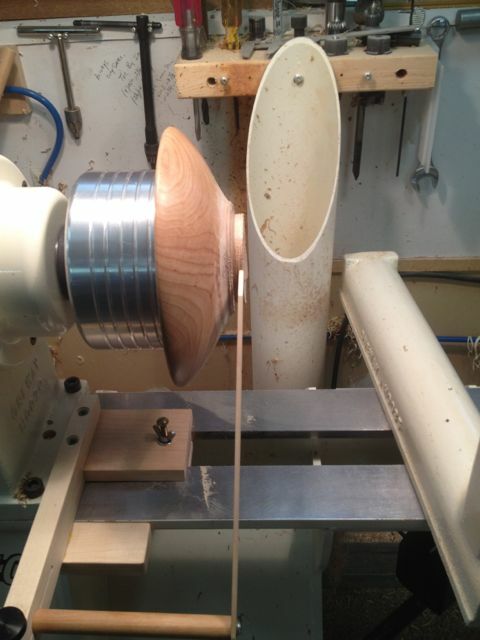 Several weeks ago I published a blog here, and on several Wood Turning Forums, relating to my experience where I turned through the bottom of a Natural Edge Bowl. This, mostly the result of using a vacuum chuck while finishing the bottom while not being able to tell exactly where the bowl bottom (inside and hidden by the vacuum chuck) actually was. 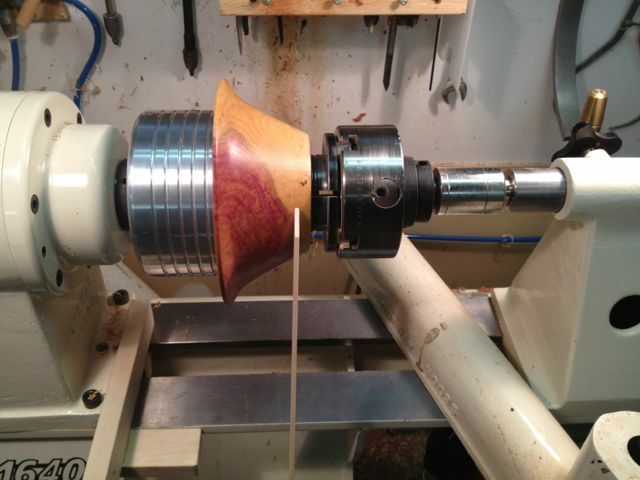 I didn’t know how to locate the bottom and so I posted the question on a few of my favourite Wood Turning Forums and got lots of suggestions but most were aimed at finding the depth(bottom) before the bowl is reversed onto a vacuum chuck. The main problem as I see it, is once the bowl is mounted to a vacuum chuck the bottom is totally hidden and unavailable to the turner. With this in mind I decided “what the heck, I’ll try to design and make one myself”. I have included a few photos that I hope will help you understand what I made and how to make your own should you decide it would be helpful. I’m sure there are some engineers out there who can polish my design but I am but a lowly wood butcher. I decided what I would need first was a reference point on the lathe which I could measure from. My lathe bed does not extend past the Head Stock so I was unable to just mark it, this would have been a plus. Here’s the point I decide to use. Next I needed is a measuring stick, I made mine from a 1/2″ wooden dowel. 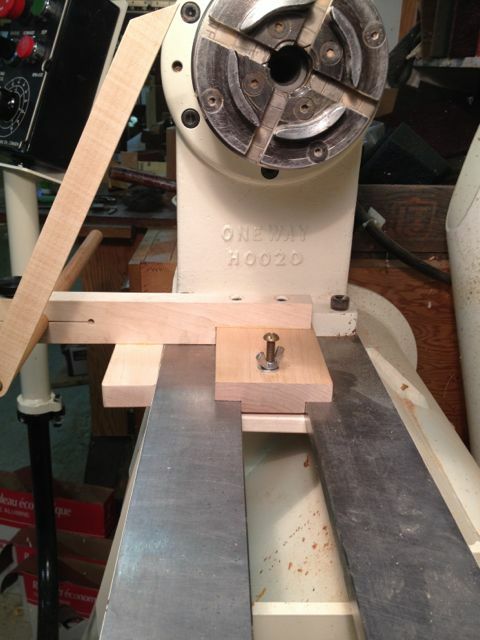 This dowel needs to be long enough and a small enough diameter that will allow it to reach through your headstock when a vacuum chuck is installed and onto the bottom of the bowl. I made mine about 22″ long. 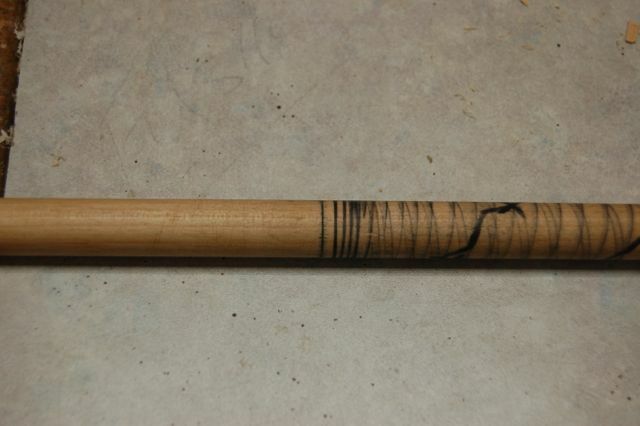 You can see the ‘hatched’ section on the dowel. This is the distance from the outboard end of my headstock drive shaft to the reference point. I put a fine notch in the dowel at that point and highlighted it with a black felt pen to give me a fine reference line. Next a ‘Stopper”‘ is required which can slide along the dowel against the outboard end of the drive stock to indicate the exact distance from the outboard end of the drive stock to the inside bottom of the bowl. This stopper needs to fit snug on the dowel so it will stay in place when moved. As you can see, I drilled a hole slightly smaller than the dowel then I added a band saw cut to small hole to allow the sides to flex and hold tight to the dowel. 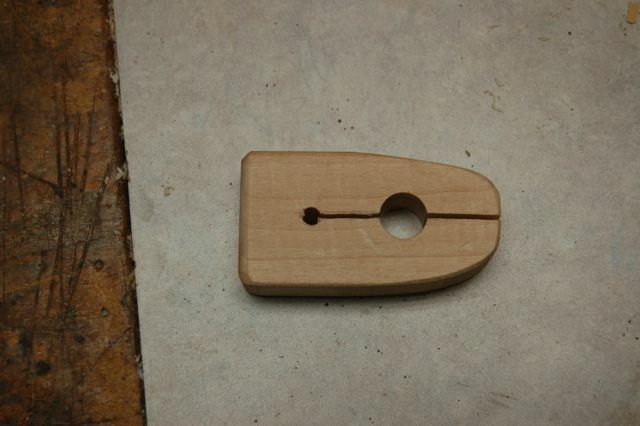 Here’s the stopper on the dowel and inserted through the drive stock. 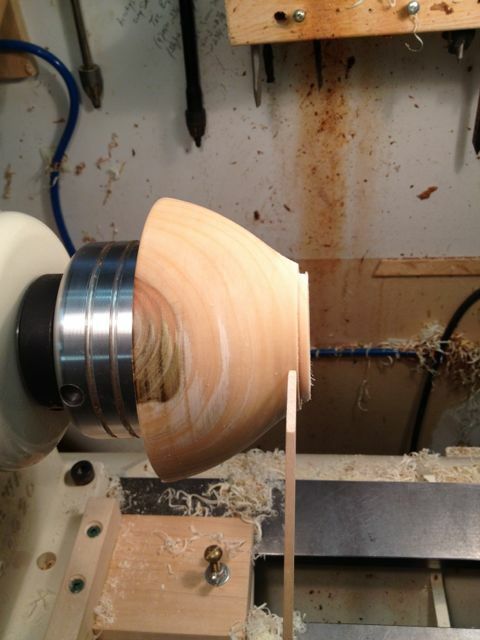 insert push the dowel through the headstock and the vacuum chuck until it touches the bottom of the bowl. 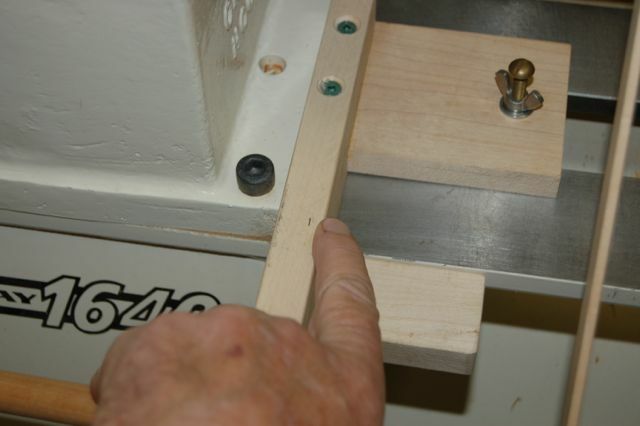 Then slide the “Stopper” along the dowel until it touches the outboard end of the Head Stock Drive Spindle, this gives what I call the offset distance. That is, the distance between the reference line on the dowel and the ‘stopper’. Here can be seen that I have set that distance to the left side of the indicator arm. Next Next thing needed is the heart of the device. 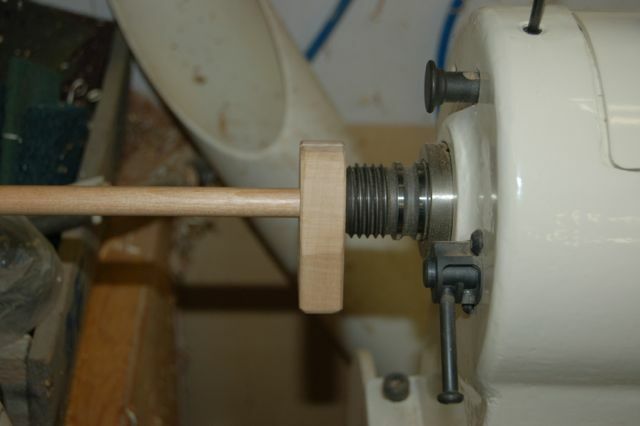 A jig that mounts to the lathe (or lathe ways as I did) that can be set to indicate the inside bottom of the bowl. I made mine from scraps of maple, a dowel (the thicker the better), a threaded insert, a knob and shaft to lock the dowel in place and a few other bits and pieces I found laying around my shop. Here is a shot of all the parts when the unit was partially assembled. 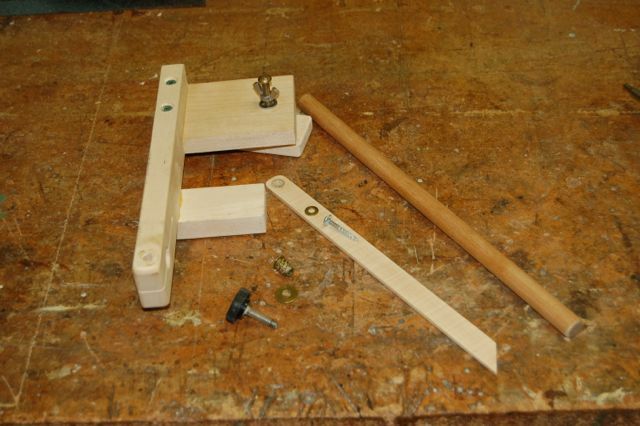 This is a photo of the assembled jig. I made my jig to ‘lock’ onto my Lathe Ways. I did this so I can leave it in position and just swing the Indicator Arm up to the bowl whenever I want to check as I finish the the bowl. Here’s a photo with the arm swung down out of my way. 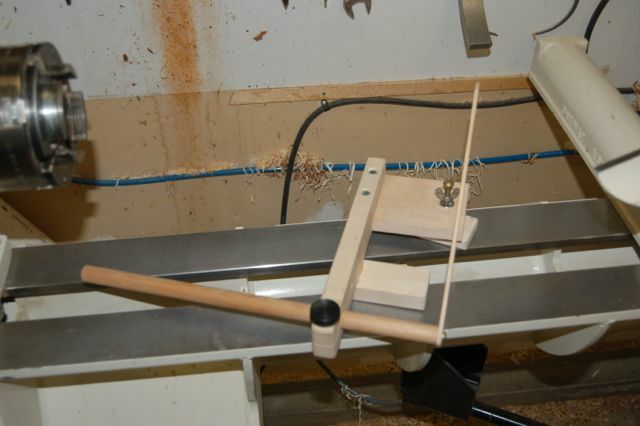 And a few photo’s of the jig in action. And there you have it. I hope this all makes sense, it was much easier to make than to describe. If you have any questions I would be happy to try to answer them for you. Today I thought I’d share the process that I go through to make a natural edge bowl. This is what I should do to prevent the production of a ‘funnel’ as in my first post. I’m sure there are many many many things that I don’t do that others do. This just happens to be the way that works best for me. I first cut the log or in this case a branch a little longer than the diameter of the branch.Then I split it on the pith using a chain saw or band saw. This happens to be a piece of Cherry that a long time good friend on Vancouver Island was nice enough to let me have. 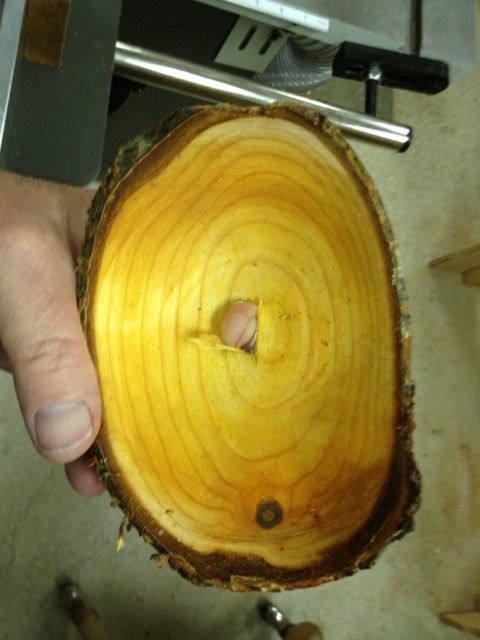 I next drill a 1″ hole just through the bark to allow my spur centre to get a good grip. Next I knock the corners off with my brand new Laguna band saw, here’s a link to a review of this saw. 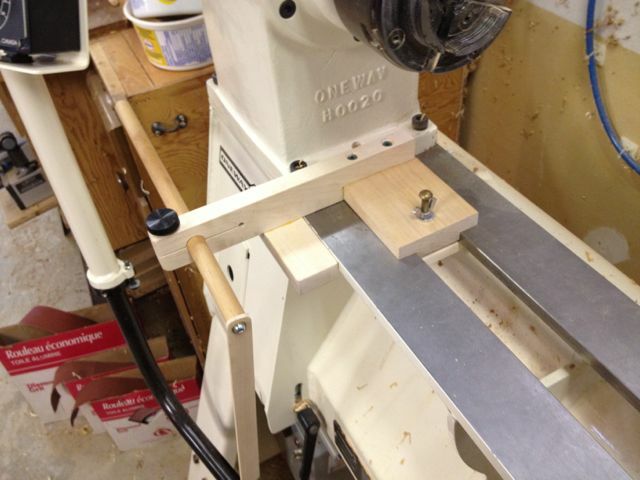 I mount it on the lathe with the bark side towards the head stock, like so. I then shape the outside of the bowl. Because of the shape of a NE bowl this picture looks a little strange. This is where you can decide what shape you want. I sand the outside with coarse paper with beeswax and mineral oil at this time. 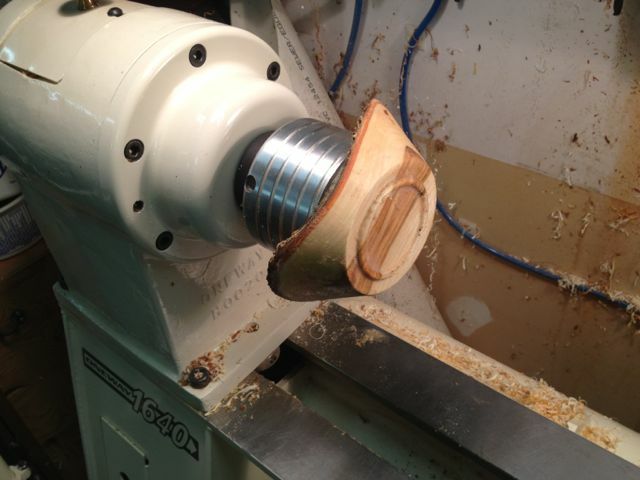 Now I reverse the bowl on my scroll chuck, utilizing the foot or tendon I made earlier. 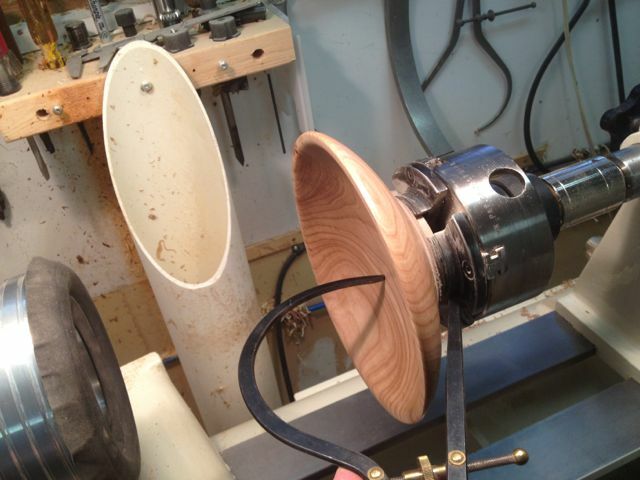 I can now hollow it to the wall thickness that best suits the bowl. If I am going to finish it green I try to turn as thin as I feel comfortable with. Then sand the inside with course sand paper if needed, using the same combination of bees wax and mineral oil. This is where it gets a little tricky. I now reverse it again and mount on a vacuum chuck to remove the tennon and turn the bottom to final thickness. Once in a while this step results in a ‘funnel’ when I try to turn the bottom a little too thin. Final sanding and burning my name and # on the bottom is nearly the last the step. Then I put it in a brown paper bag, I mark the bag with date, type of wood and any other pertinent information and hope it dries without cracking. Please don’t hesitate to leave a comment or question.